My mom received a devotional book book for her birthday in 2009 that really changed her prayers and ignited her heart. 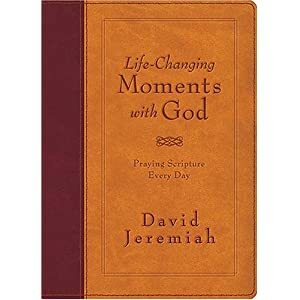 It is Dr. David Jeremiah’s Life-Changing Moments with God – Praying Scripture Everyday. She has been through several copies now and buys them for people she loves a lot. But she actually gave me her first copy. It has notes from 2009, 2010 and even 2011 in it. My mom is not of the “journaling” era, but it became her journal-of-sorts. It is the record of her prayers for her family. In it, she shares day-to-day happenings in the margins (“Found a bird with a broken wing today on the sidewalk. I placed it in the shade, but it died at 7 o’clock pm“), and things she is praying about (“Praying THIS for Joe today.”). As she reads and prays through it, her Webster’s Dictionary is always nearby so she can read the passages mentioned and write down synonyms and word meanings (“Shield: defense against blows.”). Accordingly God also, in His desire to show more convincingly and beyond doubt to those who were to inherit the promise the unchangeableness of His purpose and plan, intervened (mediated) with an oath. This was so that, by two unchangeable things [His promise and His oath] in which it is impossible for God ever to prove false or deceive us, we who have fled [to Him] for refuge might have mighty indwelling strength and strong encouragement to grasp and hold fast the hope appointed for us and set before [us]. Rich stuff. 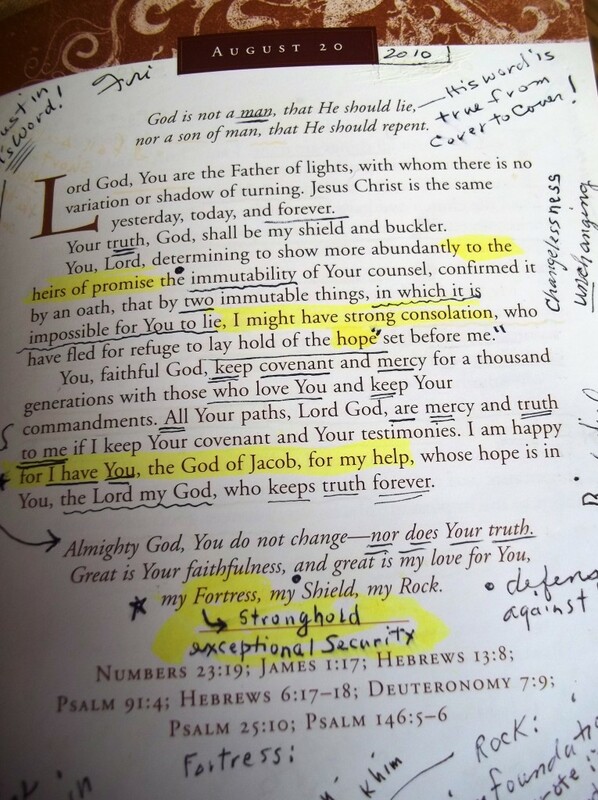 In the Word and in the margins. we who have fled [to Him] for refuge might have mighty indwelling strength and strong encouragement to grasp and hold fast the hope appointed for us and set before [us].